Messerschmitt P.1101 was the name attached to a single-seat, single-jet fighter developed in response to the July 1944 Emergency Fighter Program, which sought the second generation of jet fighters for the Third Reich. A characteristic feature of the P.1101 prototype was that the sweep of the wings could be changed before flight, a feature perfected by the later Variable-sweep aircraft such as the Panavia Tornado, MiG-23, Bell X-5, F-111 Aardvark and the F-14 Tomcat. Within nine days of the 15 July 1944 issuance of the design specifications for the Emergency Fighter, the Messerschmitt design bureau under Woldemar Voigt had formed a preliminary paper design for the P.1101. The aircraft which was developed initially had a short and wide fuselage, tricycle landing gear, and mid-mounted wings with an inner sweep of 40 degrees near the fuselage, and a shallower 26 degree angle outboard. The single He S 011 jet engine was to be mounted internally within the fuselage, being aspirated by two rounded intakes located on either side of the cockpit. The tail was of a V configuration, and mounted on a tapered boom which extended over and past the jet exhaust, while the cockpit was forward mounted, with the canopy integrated into the fuselage and forming part of the rounded nose of the aircraft. By late August 1944, the design still in paper form had evolved into a sleeker incarnation, with the previously stout fuselage lengthened and narrowed with a conical nose section added in front of the cockpit. The double angled wing was also abandoned, with the outer wing of the Me 262 instead being adapted for the design. The design was further developed, and after the wind tunnel testing of a number of wing and fuselage profiles, the design was further modified and finalized, with the decision made to undertake the construction of a full-scale test aircraft. This finalized design and associated test data were submitted to the Construction Bureau on 10 November 1944 and the selection of production materials was begun on 4 December 1944. On 28 February 1945, the RLM settled on a competing design, the Focke-Wulf Ta 183, as the winner of the Emergency Fighter program. This decision was based in part on the considerable design difficulties being encountered by the Messerschmitt P.1101 design team. For example, the cannon installation was proving too crowded, the mainwheel retraction and door mechanisms were too complex, the fuselage needed a great number of "strong points" to deal with loads, and the anticipated performance had fallen below the RLM specifications due to increased weight. Since considerable work had already been done on the P.1101 design, the RLM decided to continue reduced funding in order for Messerschmitt to carry out experimental flights testing the swept back wing at anticipated speeds up to Mach 1. 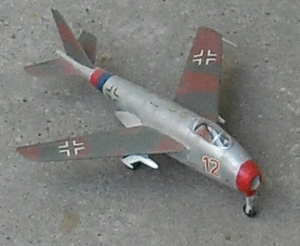 The worsening war situation led to the expedited, but risky approach of building a full-scale prototype in parallel with detail construction and continuing statistical calculation, while existing components such as the wings (Me262), landing gear (extended Bf109), and flight components were utilized where feasible. It was also intended for the test flights to be conducted with 35, 40, and 45 degree wing sweep. Production of the V1 prototype was begun at Messerschmitt's Bavarian Oberammergau Complex with a projected first flight in June 1945. The P.1101 V1 prototype was of duralumin fuselage construction, retained the outer wing section of the Me 262 but with larger slats and as mentioned previously, the wing sweep could be adjusted on the ground from 30, 40, to 45 degrees, making it a forerunner of later variable-geometry designs. The tandem, fuselage mounted intakes of the preliminary designs were replaced by a single nose intake, and the canopy became a bubble design, which afforded better all-around vision than the initial integrated canopy offered. The production prototype also incorporated a more conventional swept tail design, which was constructed out of wood and remained mounted on the tapered tail boom. A T-tail was also designed. The tricycle undercarriage consisted of a steerable, rear retracting nose wheel and long rear retracting wing root mounted main gear. The prototype was fitted with an apparently inoperable Heinkel He S 011 jet engine, but given the non-availability of this engine it is presumed that a considerably weaker Jumo 004B would have been fitted for test flights. In addition, the production model was to be equipped with a pressurized cockpit and armored canopy. By the time an American infantry unit discovered the Oberammergau complex on 29 April 1945, the V1 prototype was approximately 80% complete. Wings were not yet attached and appear to have never had skinning applied to their undersides. The airframe was removed from the nearby tunnel in which it was hidden and all associated documents were seized. There was some lobbying by Messerschmitt Chief Designer Woldemar Voigt and Robert J. Woods of Bell Aircraft to have the P.1101 V1 completed by June 1945, but this was precluded by the destruction of some critical documents and the refusal of the French to release the remaining majority of the design documents (microfilmed and buried by the Germans), which they had obtained prior to the arrival of American units to the area. The airframe, considered of no intelligence value after an interview with Voigt revealed its many design flaws, was put on outdoor display and became a favorite prop for GI souvenir photos. The prototype was shipped first to Wright Patterson AFB, then to the Bell Aircraft Works in Buffalo, New York in 1948. Damage ruled out any possibility for repair although the Me P.1101 design components were subsequently used by Bell as the basis for the Bell X-5, which was the first aircraft capable of varying its wing geometry while in flight. It is interesting to note that several engineers, including Bell's chief engineer Robert Stanley, resigned in protest over the decision to proceed with Woods' pet project, which in the end indeed verified the considerable basic design faults. The remnants of the P.1101 were scrapped in the early 1950s. Myrha, David. Messerschmitt P.1101- X Planes of the Third Reich Series. Atglen, PA: Schiffer Military History, 1999. ISBN 0-7643-0908-0.